If you were unable to make it to the 2017 TriggrCon that occurred in Tacoma, WA between July 27-30, here is a quick walk around the range and the show. TriggrCon resembles a mini-version of SHOT Show with a much more intimate setting. The public is welcome and the crowds were manageable. For more information, visit the TriggrCon Webpage. In case you do not receive email updates from Rainier Arms, they just put out an update on TriggrCon Events that are taking place at the Tacoma Convention Center (located at 1516 Commerce Street, Tacoma, WA) and surrounding area from July 27-30, 2017. If you are not familiar with TriggrCon, this is how it is described on their website, triggrcon.com: “Triggrcon is a 4 day event in Tacoma, Washington. It will include a range day and industry day open to media and industry attendees and the final 2 days for enthusiasts. Triggrcon will showcase the newest, most innovative companies and products in the tactical firearms industry. The conference will be capped in exhibitors and attendees to maintain an intimate and exclusive environment. Think of TriggrCon as a publicly accessible, no-cost, mini-version of SHOT Show. Shoot a virtual USPSA stage for a chance to win a Sig P320 RX! Each contestant will have 2 runs and will keep their fastest time. The top 3 times will win big, with the fastest time winning the Sig P320 RX. There will also be random giveaways, provided by Fortis Mfg, to those who participate. Come meet NY Times Best Selling Author Scott McEwen and many more amazing authors at Triggrcon’s Author’s Network. These authors will be speaking all throughout the event, as well as, signing books at vendor booths, so be sure to come and listen to these author’s amazing stories! Click the banner for more information on the VIP Party. The VIP event will be an intimate gathering of tactical industry leaders, first responders, military VIP’s and VIP ticket holders. The VIP event will include some of the best NW spirits & beverages, amazing food, exciting tactical entertainment, giveaways and a raffle that will benefit our charity The PTSD Foundation. Tickets are $100 and the event will be held on July 29. Click the link in the banner for more info. Come check out our Triggrcon Pro Shop where we will be selling products from several different vendors from the show. We will also be offering “show only” specials, so be sure to stop by for some crazy deals. After the hugely successful inaugural year of the NWSSE with 4000 registered attendees and nearly 80 vendors, the most frequently asked question was about its future. With all of the positive feedback we received during the show, we’re not at all surprised that all of the vendors we’ve contacted that were in attendance this year have already recommitted for 2017 such as; Mega Arms, Vortex Optics, Falkor Defense, Agency Arms, Battle Arms, Noveske to name a few. We will also be welcoming AXTS Weapons, Phase 5 and many new participating manufacturers for 2017. We will be changing the name from NWSSE to TRIGGRCON (Tactical Research Innovation Guns and Gear Review Convention) to better reflect the atmosphere and purpose of the event. TRIGGRCON is an exclusive selection of the top, innovative small arms companies and auxiliary manufacturers showcasing their new products and accessories. Manufacturer selection will be by invitation only and limited to an intimate number not to exceed 150 companies. There will be a media range day for live fire demonstrations and show times that are reserved strictly for media. TRIGGRCON is also open to the general public during all other show times so enthusiasts can have direct access to the elite manufacturers that participate in the show. For 2017 and its immediate future, the convention location will be in Tacoma Washington. However, we are exploring possibilities for other cities for possible expansion. 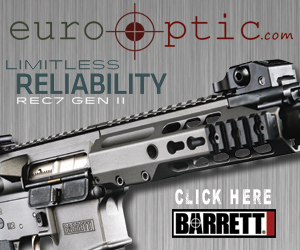 Rainier Arms has just announced their new Back Up Iron Sights (BUIS) that are made in Germany. They look very low profile, lightweight and robust. I am excited to check these out. I have not seen them available on their webpage yet, but keep an eye out for them. If you are familiar with the benefits of Amazon Prime and the free two day shipping and are a consistent purchaser of firearms, parts and accessories, then the Rainier Arms Apex Program is perfect you. The program is in the initial offering stages and has some very promising perks. Once you become a member of Apex, you have 90 days to decide if it is or is not for you and will receive a 100% refund if you decide to cancel. As for pricing, Apex members will also receive specially discounted pricing that is possible due to Rainier Arms massive inventory. Free Shipping! On a huge order, free shipping may not be overtly noticeable. However, if you only need a small inexpensive part, free shipping can be huge, especially when the shipping is more expensive than the part being ordered. With the Apex Program, all orders to the Contiguous United States will come with free ground shipping. The Apex Program will also come with Special Club Access to new product listings, special access to events, demo days and more. The Apex Program’s cost is $99.00, with a special intro price of $79.99. Check out the video for more information on the Apex Program from the Big Bossman himself, John Hwang.